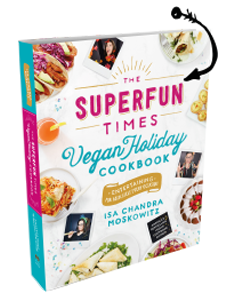 ISA CHANDRA MOSKOWITZ is the bestselling author or coauthor of the hit books Isa Does It, Veganomicon, Vegan with a Vengeance, and many other titles. 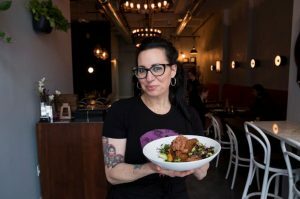 She created the beloved website Post Punk Kitchen (now IsaChandra.com), and her restaurant, Modern Love, has locations in Omaha and Brooklyn. “The most important things to know about me: I was born and raised in Brooklyn, I love cats and I love to feed people, myself included. I’m a cooking show addict and I also love the Golden Girls. I try to parlay my love for the kitchen into my love for social justice whenever possible. I’m a strong believer in baketivism. Bake sales, benefit dinners, or outreach via cupcakes, I believe that tastebuds are the perfect vehicle for change. I’ve been writing cookbooks since 2005. I also do food photography, and I garden and I play guitar. I started cooking when I went vegetarian as a teenager. The first vegan cookbook I ever cooked from was the Tofu Cookery, by Louise Hagler. It was a really important cookbook for my family, because we never really cooked together before that. We’d make Barbeque Tofu, or Tofu Balls And Spaghetti, and it really brought us closer. It was then that my love of cookbooks began! My friends and I also formed a kitchen posse. We cooked for any old reason: birthdays, holidays, road trips, touring bands. We’d stay up all night making an elaborate seitan roast, wake up in the afternoon and make pancakes, go to an anti-fur demonstration then start all over again! People often ask if I’m self-taught, and I guess that, yes, technically I’m self-taught. But really I’ve picked things up from all of the awesome and skilled people I’ve worked alongside over the years. From the guy at Food Not Bombs who showed me how to slice 10 pounds of broccoli in under 10 minutes, to the prep cook at a Brooklyn restaurant where I was a waitress who taught me to slice onions – the world has been my cooking school. And sometimes I’m just plain spying – like in my twenties when my roommate would make her secret maple potatoes and I would pretend to talk to her about some guy, but really I would be stealing all of her potato knowledge.